IAM and Guide Dogs staff members mark the 110 Anniversary of Harley-Davidson. Standing left-to-right, Chuck Jordan, Director of Programs/Licensed Guide Dog Instructor; Bryan Young, Licensed Guide Dog Instructor; Brandon Mortenson, LL 78; and Tom O’Heron, IAM Director of Collective Bargaining, and Ash the Guide Dog. Bikers know that while four wheels move the body, two wheels move the soul. Since 1903, Harley-Davidson has been helping bikers move their souls. The iconic “Harleys” have seen service in police departments, in World Wars I and II, appeared in classic films like Easy Rider and gone on to become the motorcycle of choice among bike enthusiasts. This year marks Harley’s 110th anniversary. International and national motorcycle enthusiasts flocked to Milwaukee to celebrate. The IAM and the United Steelworkers (USW) showed union pride by passing out nearly 7000, 110th special IAM /USW/Harley bandannas and thousands of bottled waters. 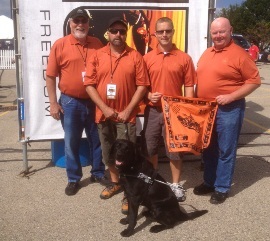 Guide Dogs of America was also in the Harley spirit, at the tent, running guide dog demonstrations three times a day. IAM and USW members are keys to Harley-Davidson’s success. When Harley-Davidson was struggling and nearly bankrupt, IAM and USW members helped turn the company around and into one of America’s leading manufacturers in the United States.